Gabriel Stulman's swanky New American restaurant at Freehand New York hotel. About the restaurant & décor: On the ground floor of the Freehand New York hotel is this handsome 80-seat restaurant from Gabriel Stulman's Happy Cooking Hospitality, designed by Roman and Williams. (The group is also behind the George Washington Bar and the all-day café, Studio.) 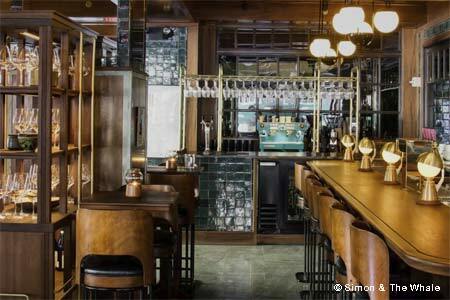 At Simon & The Whale, Japanese Iroko wood, green-blue tiles, shiny brass details and a wood-paneled wraparound bar create a sleek, fun vibe. Likes: Ambience; Arctic char toast; cocktails; Spaghetti Acqua Pazza; Wagyu steak. Dislikes: Scene-y and hard to get a table. Food & Drinks: Chef Matt Griffin oversees the crowd-pleasing menu, with a nuanced take on New American eats. Griffin has a way with seafood, as evidenced by his simple, clean Arctic char toast, black bass crudo with puffed rice and coconut milk, and Spaghetti Acqua Pazza, classic linguine and clams made briny and sweet with Castelvetrano olives and blistered cherry tomatoes. Joe Geinert, formerly of Gramercy Tavern, is the restaurant’s own butcher. He breaks down a marbled Wagyu steak, which is rich, juicy and served with beets and bordelaise. Aaron Thorp, the beverage director at Freehand, curates a wine list with an emphasis on bottles from Italy and France. Cocktails are imaginative, like the Cloud Cover, a mix of vodka, crème de violette, Prosecco and egg whites that really does resemble a fluffy cloud. For dessert, chocolate buckwheat cake is served with a surprisingly luxurious chicory ganache and assam tea ice cream.